Have you been reading our tips using vinegar for cleaning and disinfectant - but just hate the smell of vinegar? Have I got a tip for you! And it won't cost you an extra penny! You simply use something you would normally throw away! 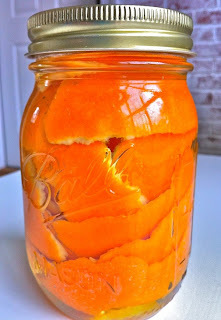 Soak the left-over peels from a couple of oranges in vinegar for two weeks in a sealed 16-ounce mason jar. After two weeks, pour the vinegar into a spray bottle. Then you can use as a non-toxic and yummy smelling green cleaner. You could also use lemons, limes, and Clementine peels instead! To speed up the process: Heat the vinegar in the microwave and poured the hot vinegar over the peels. It's only been a few hours but the vinegar smell is mostly gone already, the citrus is heavenly and just need to put it to work, though I might run it through a coffee filter first. IDEA: Once you make this, you can also use it to help mosquito bite itches. We used to fill up old roll-on deodorant bottles - or bingo dabbers with vinegar and the boys loved to use it on their bites! IDEA: You can add cloves to the mixture. IDEA: I was just thinking... I have been using vinegar in my wash instead of fabric softener, and to clean out my front-loading washer. I wonder how this would smell for that?? Wynn Genea-Chris posted: I have done this, it works great. I'm gonna try on bites - can't stand itching. Thanks. Yvonne Baxter posted: I have done this and love the results. The orange peels don't make the vinegar sticky or oily only scented. When my family peels an orange, we put the peels in a freezer bag and pop them in the freezer until we have enough peelings to make a fresh batch of scented vinegar. I have also used a combination of oranges and lemon peels. Smells wonderful! Lisa Ferguson Sullivan posted: FYI: Be extremely careful when heating liquids in the microwave (this is how a friend of mine got burned). Allow the liquid to cool for two minutes before opening microwave. Yvonne Baxter posted: If you are in a hurry and you require scented vinegar in an instant, try using scented oils. My laundry rinse is vanilla scented vinegar! Kristin Davis posted: It also makes a good degreaser. You just have to let it sit a while. Jill Adams Bowsher posted: Gotta smell better than plain vinegar! Kim Clayton posted: Great idea! Amanda Hunt posted: Awesome. Can't wait to try it.